This quaint two bedroom cottage is ideal for a private vacation. Enjoy the peaceful setting while fishing from the pier or in the rowboat provided weather permitting. Off-dock swimming, picnic table, charcoal grill and lawn chairs are there for you. Full kitchen and window A/C are provided for your comfort. You were great, so happy we found you! Everyone that I encountered was very helpful and kind. I simply cannot wait to come back! We love Chesapeake and will continue to rent as long as the property is available. Team members were helpful when needed and went above beyond to find me the cottage. Again, making it possible to have use of the trolling motor. 49 weeks till we see you again for our 9th year in a row. It was wonderful,and we will be back next year. We adored Chesapeake! Great space, everything we needed was there. We enjoyed taking the row boat out onto the lake. It was nice to be out in the country were it was peaceful but able to go into The Dells after a quick drive. We will most certainly be returning in the future! They were great let us check in early or our cooler of food would have been melted. Absolutely loved the stay. It was perfect. 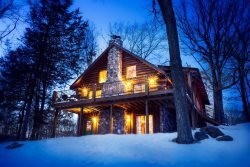 Secluded but within reach of the dells. Beautiful Lake parker will be a destination of ours for years to come. The Sand County staff are very well prepared, friendly, and helpful with your stay on one of their rental units. We asked to stay one day later and even received a discount! What a truly amazing vacation. Staying at the prperties with Sand County was truly amazing and a slice of heaven. We were able to relax with the comforts of home, off of Parker Lake and also have the fast pace action of the Dell's just down the road. The staff is helpful and the service was perfect. Give Sand County a try, you won't be disappointed. You are all a great staff to work with. Since 1987, I have stayed on Parker Lake through Sand County. Always the experience was rewarding for my family and myself. The property is well maintained and my children have been able to share the "lake experience" unlike the mad crowds at waterparks nearby. Thanks for keeping the memories growing in the next generation. It was great, everyone that was with us on this trip loved the property, want to rent it again and cant wait to go back!! The staff was extremely curtious and knowledgable about the area. I have not been that relaxed in a very long time. Everything was great. The staff was very friendly and helpful. I would highly recommend staying with them! Our property was amazing for a four family members. We really enjoyed relaxing with boating, fishing, grilling, and the fire pit for tasty s'mores. Not only did we relax as a family, we were close enough to the Dells for an exciting fun adventure. I would highly recommend a stay in one of their facilities, you will be extremely please!!!! !